It may be 'just' pliers—but it's pliers! With our skilled technology, we will continue to be committed to quality above all else. The air gaps inside the metal are crushed, to enhance the strength and form the metal into the intended shape. This is the most important process that decides the quality of the product. By the fine-tuned checking of product quality, if there are products with poor quality, we immediately stop production to prevent poor-quality products from being sent to the next stage of the process. Additionally, when there are requests from the post-process, we always improve the forging to meet such requests. First, the metal is machined to make it closer to the shape of a final product. You might think it's 'nothing but pliers'. But we do process the metal, using many machines, to make a single pair of pincers. We make proper adjustments of individual machines, committing ourselves to making only the highest-quality products. After combining the right and left parts by inserting a pin, the operator manually makes adjustments. For the first time, the metal is formed into a pair of pliers. In this process, the left and right parts, sent separately from the machining process, are assembled into a single item. Since this process is the groundwork for the post-process, the operator checks each pair of pliers, individually, to make sure there is absolutely zero mis-alignment when the left and right parts are assembled, making delicate adjustments, if necessary. After quenching the entire part, the operator applies high-frequency induction quenching to increase the hardness of the tips. The operator applies quenching equally to the left and right blades to increase the hardness, in order to produce highly durable blades of equal hardness. However, if the metal is too hard, it becomes rather brittle. Therefore, we check the products with rigorous standards, by conducting tests on body hardness, blade hardness and impact resistance. If the edges of right and left blades hit each other accurately, their durability becomes inferior, while if they are overlapped too much, the sharpness becomes inferior. This process decides the cutting sharpness, which is the most important for all types of pliers. The bottom ends of the blades are used for cutting, in the case of side cutting pliers, while the top ends of the blades are used for cutting, in the case of nippers. Therefore, the operator manually sharpens the edges of blades, one by one, by thinking about how the products will actually be used. In addition, since durability depends on how the edges are sharpened, the operator conducts the edge sharpening operation by being conscious, not only of its sharpness, but also its durability. In this finishing process, the products are carefully polished. This process is not directly related to the function of the product. However, if a product has a poor appearance, customers will be reluctant to pick them up from the shop counter. Therefore, we carefully polish our products by paying full attention to appearance, including the balance between the left and right parts, uniformity among each product and offer beautifully polished surfaces. When products go through the production processes, individual parts sometimes have various delicate misalignments. 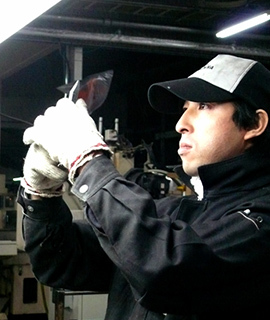 The operator carefully makes manual adjustments to correct such delicate misalignment to produce the high-quality products of the FUJIYA brand. My name is Yoshimitsu Onkoshi and I am an operator in the edge sharpening process. I have been in charge of sharpening the blades edge of pliers and nippers using files for 10 years, which process comes after high frequency induction hardening. Originally, I entered FUJIYA with a wish to become a salesman. However, when I saw an operator performing edge adjustments during my visit to the workplace, I strongly felt that I wanted to do this work and so, I chose to work as an edge-sharpening operator! For pliers and nippers, cutting sharpness is the most important element. I find my job rewarding because I can process pliers and nippers myself and judge the quality of cutting sharpness, so that FUJIYA delivers the best quality products to users. In the actual edge sharpening operations, with the aim of keeping both good sharpness and durability, I need to overlap the right and left blades edge very delicately, on purpose, to prevent the very hard blades from damaging each other, and I handle each individual product carefully, one item at a time. All edge-sharpening operators are making their very best efforts to deliver the best quality products to those users who daily need FUJIYA pliers and nippers.